Through his senior special assistant on media, Mallam Garba Shehu, the president yesterday rejected the "unfair and ridiculous criticisms" of his silence on the planned elections in some states by APC leaders who want him to abuse his power by changing the results of the poll to favour them. Shehu said that some past presidents of Nigeria were known to interfere in inconclusive elections, adding that this may have accounted for "why party members appear to be upset that the same thing is not happening now, but President Buhari is a different kind of leader." Last week, two embattled APC governors, whose second term bid is under threat, as they came behind their Peoples Democratic Party (PDP) opponents in the inconclusive elections, rushed to the presidential villa to allegedly seek Buhari's help. He said: "Party members in states where there will be supplementary elections then need to be reminded that they need to work hard to earn their people's votes, rather than expect President Buhari to manipulate INEC in their favour. "Interestingly, while members of the ruling APC were criticising the president for not interfering on their behalf, members of the opposition were condemning the president based on their assumptions that he would definitely interfere, as many in the opposition, did while in power. "Under President Buhari, INEC has been and will be completely independent throughout the elections, free from any interference. President Buhari is a man of conviction, and the manipulation of election results goes against everything he stands for, INEC is completely in charge," he said. Meanwhile, the governing APC has passed a no-confidence vote on INEC and faulted the commission's latest decision on the inconclusive elections in some states. With particular reference to Rivers and Bauchi States, the APC said that INEC's decisions, among other things, had denied the party the chances of fielding candidates as in the case in Rivers and considerably dwarfing the party's chances. In its position yesterday, titled: "INEC's Supplementary Elections, Illegal Decisions on Rivers, Bauchi States: Our Stand!," APC national publicity secretary, Mallam Lanre Issa-Onilu, alleged complacency on the part of INEC. He insisted that there was an "unholy alliance" between the umpire, the PDP and its governorship candidate in Rivers State to prevent "Rivers people from electing a candidate of their choice by imposing Wike." On Benue State, the APC said that "even though the PDP claims a bogus lead of over 81,000 votes, reports strongly establish that this dodgy figure is an aggregate of 'votes' obtained by subterfuge, not from the numbers recorded by the card reader. "There were cases in Logo, Gwer-West, Vandeikya, Guma, Buruku and Gboko local governments where the card reader was not used. INEC also reported that 41 polling units in Vandeikya did not use the card reader, as it was the case in many in Gwer-West, Gwer-East, Gboko and other places." Issa-Onilu said. While stating its position on Rivers, the APC said that "we are concerned and deeply troubled by the unfolding events in Rivers State. The APC strongly condemns this horrid dance in Rivers State. This unholy alliance between Governor Nyesom Wike, PDP and INEC are to prevent Rivers people from electing a candidate of their choice by imposing Wike, the PDP candidate on them. It was glaring that Wike was losing until INEC stepped in to halt the process apparently to save Wike from impending defeat. INEC must put a halt to this madness and brazen illegality. "With regard to the governorship election in Rivers State, APC has observed with dismay the macabre dance between Wike and INEC. It is on record that Wike through the Rivers State resident electoral commissioner (REC), Obo Effanga, engaged PDP card-carrying members as Local Government Area (LGA) Collation Officers to skew the elections in favour of Wike and the PDP." The party tasked the INEC chairman, Prof. Mahmood Yakubu to "immediately redeploy Effanga in order to avoid the crisis that may follow the organised crime being executed by Wike and the REC to rig and alter the results of the 2019 governorship polls in favour of Wike. For Plateau State, the APC restated that "our comfortable lead is unassailable. We, however, urge our members, supporters and indeed the entire Plateau electorate not to be complacent, but remain focused as we prepare for the supplementary election that will give our performing candidate, Governor Simon Lalong, a second term in office to consolidate on his first term achievements." As regards Kano, the APC said that "the opposition PDP camp in its self-deceit has continued to delude itself on its non-existent electoral chance in Nasarawa local government area,' adding that "the Kano electorate cannot be deceived." On Bauchi, the party rejected INEC's decision on the governorship election results from Tafawa Balewa local government area, as signed and announced by the electoral body's national commissioner and chairman of its Information and Voter Education Committee, Festus Okoye. "While the close relationship between Festus Okoye who chaired the fact-finding committee and Yakubu Dogara of the PDP is well known, hence inappropriate for the fact-finding exercise for Bauchi State, INEC has failed to adhere to the fundamental principle of fair-hearing by not inviting our agents during the hearing to ascertain the circumstances leading to the cancellation of the Tafawa Balewa local government election results. "INEC's decision is illegal as the electoral body contravenes the provisions of the Electoral Act 2010 as amended," the party said. Turning to the saga in Adamawa State, APC said that it had reported over-voting and use of security personnel to intimidate its agents and supporters, noting that "while we are confident of our party and candidate Governor Jibrilla Bindow's victory ahead of the supplementary election in the state, we urge all stakeholders to avoid actions that can plunge the state into crisis." Okah, who is also the director of Media and Publicity of the state PDP Campaign Council, said: "The allegation is baseless and watery. We deny the allegation in its entirety. "We want them to face the reality that a day will never come when they will be declared winners of an election they lost from the unit to the top-most level. They did not win and they will never defeat the PDP in Rivers State," he said. In a statement issued by its national publicity secretary, Kola Ologbondiyan, the PDP recalled that even the recent United States (US) States Department's Bureau reports showed that state apparatus of power was used for intimidation and electoral violence to favour the government. He said: "In Benue, it is clear that the people have rejected the APC as clearly demonstrated even in the presidential election. Benue State has always been home to the PDP. It is incontestable that our party has the largest genuine followership in all the units, wards and local government areas of the state and as such does not need any underhand measure to secure victory in any election in the state. Our winning lead of 81,000 votes was validly delivered at the polling units and that reality will humiliate the APC as it cannot be subverted. "Similarly, Rivers State is an impregnable home to the PDP since 1999. The results of all the elections held in Rivers, including the state House of Assembly, showed that the PDP is in control of the state. Moreover, in Rivers, the APC is a vicious interloper, which has been perpetuating violence and killings as a means to subvert and truncate the electoral process since it has no candidate in the election. "In Kano State, the people of the state are known to be incorruptible and had always detested leaders who are corrupt and incompetent. They have always elected governors that are acceptable to ordinary people. The corruption and incompetence of the Ganduje administration are therefore distasteful to the people and that is why they have collectively rejected the APC and rally with the PDP. All the shenanigans by the APC and compromised INEC officials in Kano will, therefore, be unachievable. "In Bauchi State, the PDP has already been elected and this reality cannot be altered by the APC. INEC had already established that the APC compromised its official to declare Tafawa Balewa LGA as inconclusive and had restored the votes that were stolen by the APC. It is imperative for APC to accept the fact that its bunch of broom has become famished. "In Sokoto State, the people have given us the mandate. The constitution provides for a simple majority of votes. The declared results show that our candidate clearly won and that is why our candidate has been mandated to go to the court to seek the interpretation of the section of the constitution that deals with the declaration of results. "In Adamawa State, the APC is merely hallucinating and seeking ways to subvert the process. Its despicable resort to using a person who did not participate in the election to seek to use the courts to ambush the election is disgraceful. "However, INEC had since declared that it cannot be stopped from going ahead with the supplementary election where our party is already in good stead to coast to victory," the PDP said. The commission's national commissioner and chairman, Information and Voter Education Committee, Barr. Festus Okoye, said that the commission must ensure due process in compliance with its regulations and guidelines. Okoye said: "The returning officer and the resident electoral commissioner in Kano State regenerated results from areas with challenges. In Bauchi State, the commission has ordered the completion of collation in Tafawa Balewa local government area. 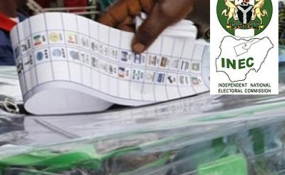 It is a matter of due process and compliance with the regulations and guidelines of the commission,"
The group said: "We wish to alert the relevant institutions and the general public about the plots by certain politicians in Rivers State using state-owned apparatus to procure both foreign and domestic observer groups to pre-empt the INEC on its planned decision over the governorship elections in Rivers State. "This plot as we gathered is aimed at manipulating and arm-twisting the commission to compromise," he said.